This article explains ClassPath in Java. A classpath is a path for the compiler to identify which class or which package we use in our defined class. It provides the compiler a way to find classes or packages that are used in our class. This article explains ClassPath in Java. From the word we understand that classpath is a path of a class. Yeah, that is correct; a classpath is a path for the compiler to identify which class or which package we use in our defined class. It provides the compiler a way to find classes or packages that are used in our class. In this definition we use the term "Package". Now understand what a package is. It is a logical container of classes, interfaces and sub-packages. A packages provides a unique space for classes and provide a scope for classes and interfaces. A class is associated with a package using the following. To associate a class with a package the following procedure is required. 2. The source file and generated class file are saved in a folder of the same name as the package. Let's assume that there are the two packages named P1 and P2. Both these packages contain A and B classes. To assert that packages of two different projects have a different name the following convention may used in the naming of the packages. Note - A package name is never associated with the Java file, in other words Java files are referred to independently. 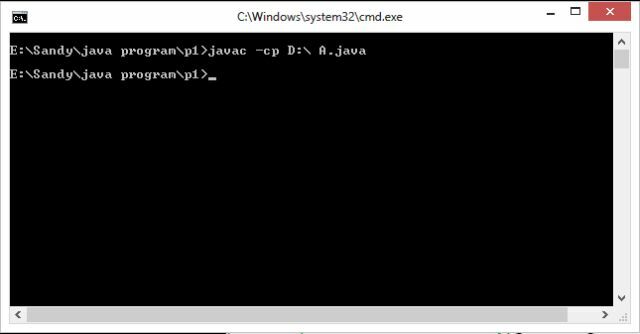 First understand a scenario; in this we create two Java files, the first one in A.java is contained in "E:\Sandy\java programs\p1" and the other one is "B.java" stored in the "D:\p2" folder. Now we have used the B.java file in the A class. So in that order we need to call the B class; that is done using classpath. ClassPath is used to tell the compiler that we are using another class contained in the path we provided. Define package p1 and class A as. This class is saved in the "E:\Sandy\java programs\p1" folder. Define package p2 and class B as. This class is saved in the "D:\p2" folder. 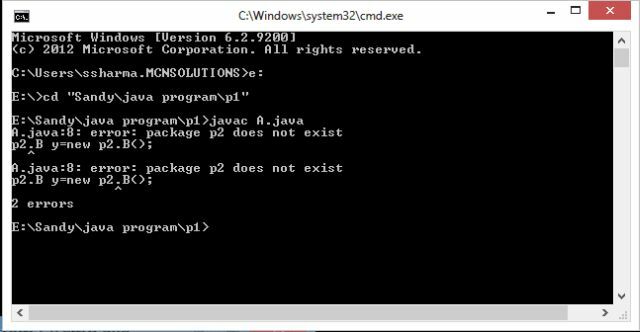 As you can see, the compiler says that the p2 package does not exist. In other words, they are unable find package p2 itself so in this order we need to tell the compiler that you need to find package p2 in the given path. The ClassPath environment variable is used by the compiler and JRE to locate user-defined classes. 1.0: Path of user defined packages are listed in the ClassPath variable. 2.0: References of classes are encountered during compilation execution. 2.1: The value of the classpath environment variable is read. 2.2: The folders listed in classpath are searched to locate the referenced classes. 2.3: If a referenced class is not found in a user defined package then it is searched for in the rt.jar file. If not found then a ClassNotFound exception is thrown. Note - The default value of the class environment variable is the current class. The value of the classpath environment variable is set permanently or can be specified for compilation and execution for a class. Note - A classpath is not applied to a Java file. 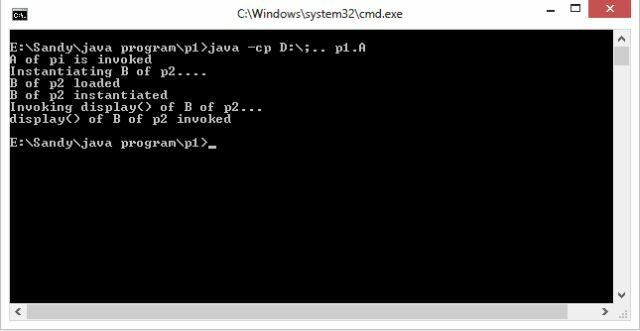 A Java file is loaded at a given path. Now compile our class A using a class path. 1. "-cp" is the syntax for the use classpath. 2. "D:\" tells the compiler that you need to find the package p2 in this folder. Now we see that there is no error generated because we are providing a path for package p2. The following explains what we wrote. 1. "D:\" is used to find package p2. 2. ".." is used to find the package p1. Since it is contained in the parent folder we use "..". If it exists in the current folder then we use "." 3. "p1.A" tells the compiler to execute class A in the p1 package. Similarly we can compile and execute our class from any location. The following are compilation commands for various locations. The following are compilation commands for executing our Class A from various locations. Similarly we can compile and execute more than one referred class.